So this is a recommendation from Silvery Dude for which he does need to receive full credit as it was a really good read; bought last year and dragged all the way to Scotland and back during my annual holiday so that I could totally fail to read it as part of last year’s RIP IV challenge, but definitely worth waiting for. And I say this as someone who has a bit of a love/hate relationship with Peter Ackroyd, though to be fair it’s currently waited heavily on the love side, if only for his masterful biography of London. 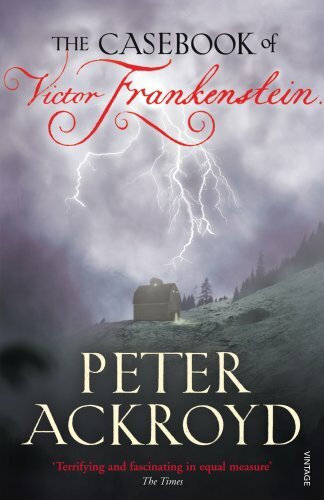 Anyway, The Casebook of Victor Frankenstein is exactly what it says on the tin; it’s Frankenstein’s own version of his experiments and their outcome with particular emphasis on those close to him. So much so normal revised version of old story, but this has a couple of interesting aspects to it which made it more than just another retelling of something familiar. There is the standard mix of fact and fiction, so we get to meet Shelley, Mary Shelley, Lord Byron and Dr Polidori. But most of the experiments take place in and around London’s East End rather than on the continent. We have resurrectionists bringing whole corpses rather than the body parts sewn together thing so beloved of old movies. We have stuff about doppelgängers, split personalities, cutting-edge scientific experimentation taken to its limits all explained by someone who can at best be described as an unreliable narrator. It has a wonderfully creepy and unsettling atmosphere which wasn’t lost on me despite the fact that I read it mostly in balzing hot sunshine rather than howling autumnal wind and rain which might have suited it slightly better. I will say that I was slightly thrown by the end which, though it makes sense when you look back at the novel seemed to happen very suddenly. But that shouldn’t take away from what was a really good story well told. I’ve picked this book up and put it down, and yours is the first review I’ve read of it that makes me wish I had it so we could read it this weekend! Excellent review, Bride! We also own London, and I keep meaning to read it, but it’s in hardcover, which means I can only read it at the house. I can’t carry it. I hope you get the chance to read this one, Susan, I’d love to know what you think of it.